For the part of an engine sometimes referred to as a "cam", see camshaft. For the name "Cam" and other uses, see Cam (disambiguation). Fig. 1 Animation showing rotating cams and cam followers producing reciprocating motion. A cam is a rotating or sliding piece in a mechanical linkage used especially in transforming rotary motion into linear motion or vice versa. It is often a part of a rotating wheel (e.g. an eccentric wheel) or shaft (e.g. a cylinder with an irregular shape) that strikes a lever at one or more points on its circular path. The cam can be a simple tooth, as is used to deliver pulses of power to a steam hammer, for example, or an eccentric disc or other shape that produces a smooth reciprocating (back and forth) motion in the follower, which is a lever making contact with the cam. The cam can be seen as a device that rotates from circular to reciprocating (or sometimes oscillating) motion. A common example is the camshaft of an automobile, which takes the rotary motion of the engine and translates it into the reciprocating motion necessary to operate the intake and exhaust valves of the cylinders. The most commonly used cam is the plate cam (also disc cam or radial cam) which is cut out of a piece of flat metal or plate. Here, the follower moves in a plane perpendicular to the axis of rotation of the camshaft. Several key terms are relevant in such a construction of plate cams: base circle, prime circle (with radius equal to the sum of the follower radius and the base circle radius), pitch curve which is the radial curve traced out by applying the radial displacements away from the prime circle across all angles, and the lobe separation angle (LSA - the angle between two adjacent intake and exhaust cam lobes). The base circle is the smallest circle that can be drawn to the cam profile. A once common, but now outdated, application of this type of cam was automatic machine tool programming cams. Each tool movement or operation was controlled directly by one or more cams. Instructions for producing programming cams and cam generation data for the most common makes of machine were included in engineering references well into the modern CNC era. This type of cam is used in many simple electromechanical appliance controllers, such as dishwashers and clothes washing machines, to actuate mechanical switches that control the various parts. 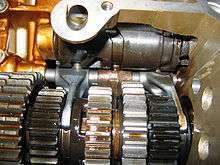 Motorcycle transmission showing cylindrical cam with three followers. Each follower controls the position of a shift fork. Constant lead barrel cam in an American Pacemaker lathe. This cam is used to provide a repeatable cross slide setting when threading with a single-point tool. A cylindrical cam or barrel cam is a cam in which the follower rides on the surface of a cylinder. In the most common type, the follower rides in a groove cut into the surface of a cylinder. These cams are principally used to convert rotational motion to linear motion parallel to the rotational axis of the cylinder. A cylinder may have several grooves cut into the surface and drive several followers. Cylindrical cams can provide motions that involve more than a single rotation of the cylinder and generally provide positive positioning, removing the need for a spring or other provision to keep the follower in contact with the control surface. 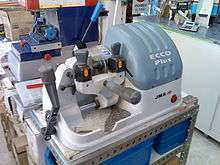 Applications include machine tool drives, such as reciprocating saws, and shift control barrels in sequential transmissions, such as on most modern motorcycles. A special case of this cam is constant lead, where the position of the follower is linear with rotation, as in a lead screw. The purpose and detail of implementation influence whether this application is called a cam or a screw thread, but in some cases, the nomenclature may be ambiguous. Cylindrical cams may also be used to reference an output to two inputs, where one input is rotation of the cylinder, and the second is position of the follower axially along the cam. The output is radial to the cylinder. These were once common for special functions in control systems, such as fire control mechanisms for guns on naval vessels and mechanical analog computers. An example of a cylindrical cam with two inputs is provided by a duplicating lathe, an example of which is the Klotz axe handle lathe, which cuts an axe handle to a form controlled by a pattern acting as a cam for the lathe mechanism. A face cam produces motion by using a follower riding on the face of a disk. The most common type has the follower ride in a slot so that the captive follower produces radial motion with positive positioning without the need for a spring or other mechanism to keep the follower in contact with the control surface. A face cam of this type generally has only one slot for a follower on each face. In some applications, a single element, such as a gear, a barrel cam, or other rotating element with a flat face, may do duty as a face cam in addition to other purposes. Face cams may provide repetitive motion with a groove that forms a closed curve, or may provide function generation with a stopped groove. Cams used for function generation may have grooves that require several revolutions to cover the complete function, and in this case, the function generally needs to be invertible so that the groove does not self intersect, and the function output value must differ enough at corresponding rotations that there is sufficient material separating the adjacent groove segments. A common form is the constant lead cam, where displacement of the follower is linear with rotation, such as the scroll plate in a scroll chuck. Non-invertible functions, which require the groove to self-intersect, can be implemented using special follower designs. A variant of the face cam provides motion parallel to the axis of cam rotation. A common example is the traditional sash window lock, where the cam is mounted to the top of the lower sash, and the follower is the hook on the upper sash. In this application, the cam is used to provide mechanical advantage in forcing the window shut, and also provides a self-locking action, like some worm gears, due to friction. Face cams may also be used to reference a single output to two inputs, typically where one input is rotation of the cam and the other is radial position of the follower. The output is parallel to the axis of the cam. These were once common is mechanical analog computation and special functions in control systems. A face cam that implements three outputs for a single rotational input is the stereo phonograph, where a relatively constant lead groove guides the stylus and tone arm unit, acting as either a rocker-type (tone arm) or linear (linear tracking turntable) follower, and the stylus alone acting as the follower for two orthogonal outputs to representing the audio signals. These motions are in a plane radial to the rotation of the record and at angles of 45 degrees to the plane of the disk (normal to the groove faces). The position of the tone arm was used by some turntables as a control input, such as to turn the unit off or to load the next disk in a stack, but was ignored in simple units. This type of cam, in the form of a symmetric heart symbol, is used to return a shaft holding the cam to a set position by pressure from a roller. They were used for example on early models of Post Office Master clocks to synchronise the clock time with Greenwich Mean Time when the activating follower was pressed onto the cam automatically via a signal from an accurate time source. This type of cam was used for example in mechanical time keeping clocking-in clocks to drive the day advance mechanism at precisely midnight and consisted of a follower being raised over 24 hours by the cam in a spiral path which terminated at a sharp cut off at which the follower would drop down and activate the day advance. Where timing accuracy is required as in clocking-in clocks these were typically ingeniously arranged to have a roller cam follower to raise the drop weight for most of its journey to near its full height, and only for the last portion of its travel for the weight to be taken over and supported by a solid follower with a sharp edge. This ensured that the weight dropped at a precise moment, enabling accurate timing. This was achieved by the use of two snail cams mounted coaxially with the roller initially resting on one cam and the final solid follower on the other but not in contact with its cam profile. Thus the roller cam was initially carried the weight, until at the final portion of the run the profile of the non-roller cam rose more than the other causing the solid follower to take the weight. A linear cam is one in which the cam element moves in a straight line rather than rotates. The cam element is often a plate or block, but may be any cross section. The key feature is that the input is a linear motion rather than rotational. The cam profile may be cut into one or more edges of a plate or block, may be one or more slots or grooves in the face of an element, or may even be a surface profile for a cam with more than one input. The development of a linear cam is similar to, but not identical to, that of a rotating cam. Key duplicating machine. The original key (mounted in the left hand holder) acts as a linear cam to control the cut depth for the duplicate. A common example of a linear cam is a key for a pin tumbler lock. The pins act as the followers. This behavior is exemplified when the key is duplicated in a key duplication machine, where the original key acts as a control cam for cutting the new key. An early cam was built into Hellenistic water-driven automata from the 3rd century BC. Cams were later employed by Al-Jazari, who used them in his own automata. The cam and camshaft appeared in European mechanisms from the 14th century. ↑ Jensen, Preben w. (1965). Cam Design and Manufacture. The Industrial Press, New York. p. 1. ↑ Cam Design and Manufacture. The Industrial Press, New York. p. 8. ↑ Introduction to Mechanisms - Cams"rise is the motion of the follower away from the cam center, dwell is the motion where the follower is at rest, and return is the motion of the follower toward the cam center"
↑ "Cams; their profiles and the velocity and acceleration of their associated followers". Retrieved 29 August 2013. ↑ Introduction to Mechanisms - Cams "The follower moves in a plane perpendicular to the axis of rotation of the camshaft." ↑ Oberg, Erik (1996). Machinery's Handbook, 25th Ed. Industrial Press. pp. 1050–1055. ↑ Clymer, A. Ben. "The Mechanical Analog Computers of Hannibal Ford and William Newell". IEEE Annals of the History of Computing. 15 (2): 19–34. doi:10.1109/85.207741. ↑ House handles Klotz lathe. ↑ "Linear cam mechanical interlock". ↑ "Calulation equations:cams". Retrieved 29 August 2013. Cam design pages Creates animated cams for specified follower motions. How round is your circle? Contains various linkages. Introduction to Mechanisms - Cams Classification, nomenclature, motion, and design of cams; information for the course, Introduction to Mechanisms, at Carnegie Mellon University.